An international community of Sisters who experience and are called to share the charismatic gift of the consolation of God. As missionaries, we have no boundaries in serving the people of God with any ministry that helps them toward human and spiritual growth. In harmony with one’s deepest self, we value a person-centered approach that honors the dignity and diversity of persons, communities, and cultural groups in connection with all creation. We are attentive to the cries of the people for justice and peace, empower them to voice their experiences of injustice and suffering toward change, and stand by them in their efforts. 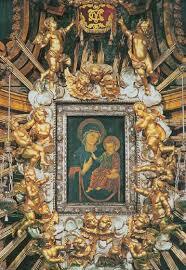 Our Lady Consolata is the title under which she has been honored for at least 1600 years. The tradition is that this icon, attributed to St. Luke, was brought from Egypt by St. Eusebius in the 4th century. St. Maximus, bishop of Turin, Italy, 380 – 420, installed the icon in St. Andrew’s Chapel, where it remained hidden because of the Iconoclast heresy until the eleventh century.